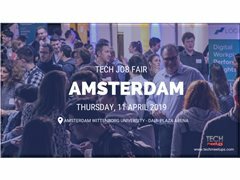 We are looking for a person who can help us with our event on 11th April from 4:30PM-6PM and from 9PM-10PM in Amsterdam. The job will be to help with venue setup, and tear down, which includes some tables and chairs movement. You will be working with the TechMeetups team and will be briefed about the event beforehand.